This article is the fifth part of our series of SEO (Search Engine Optimization) related articles - Web Page Content Search Engines See. In this article we will look at web page heading structure. There are 6 heading tags available in HTML coding. H1 is the largest and at the top of the heading structure hierarchy. H6 is the smallest and at the bottom of the heading structure hierarchy. Heading tags can be formatted in the stylesheet if the defaults are not suited to the web page. Search engines find the heading tags in the web page coding. e.g. <h2></h2> would surround a heading 2. The web page title and headings are present. 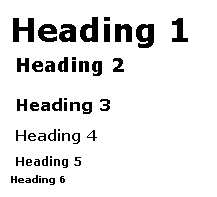 Headings are properly nested. Heading 1 being main title, and the rest flow in correct order. The heading structure used is laid out to give an effective overview of the web page subject. If the web page visitor uses a screen reader it will indicate to the visitor when they reach a heading in the text. In summary, each search engine has a different way of prioritizing the importance of headings therefore it is important to use the heading tags correctly to create proper heading structure. Search Engine Optimization - SEO Search engine optimization (SEO) requires more than adding keywords to a web page. Each search engine prioritizes the importance of headings differently therefore it is important to use heading tags correctly to create proper heading structure.